After a night of heavy rains, waste picker Bongekile Hilda Ntshangase (50) drowned in the Msunduzi River on her way back to the New England Road landfill site after she and her husband had been to the Central Waste depot to sell recyclables on September 23. Members of the Hlanganani MaAfrika Waste Picker Cooperative, the South African Waste Picker Association (SAWPA), groundWork, and other waste pickers from the area, attended her funeral. Bongekile and her husband made a living as waste pickers on the landfill site for over 15 years. The difficult situation of poverty that they – along with many other waste pickers – were forced to live in, meant they often had to cross the river either going to the depot from the landfill or vice versa if Central Waste trucks were not available to transport them in order to generate some income. Read the press release (in English). More updates from Africa coming soon in the next round-up! 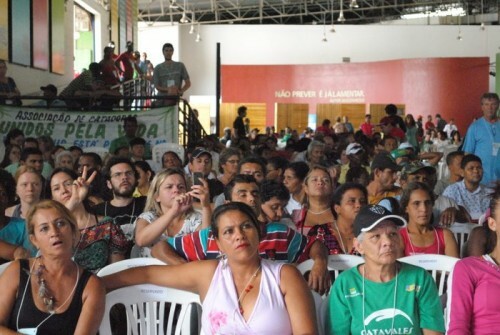 The waste pickers in the Brazilian capital showed vigor and conviction in demanding their rights and futures, going head on with the federal government and completely paralyzing a landfill (Lixão da Estrutural), transfer stations, and plants. The protest forced the government to reconsider a public-private partnership (PPP) — one which would have given a 30 year contract to one company for 5 billion US dollars. The National Movement (MNCR) demonstrated the strength of the people when they mobilize and work towards the transformation and future of our planet. Long live our struggle! Long live the MNCR! No to incineration! Announced at the Waste and Citizenship Festival, waste pickers in the state of Minas Gerais, Brazil, will become the first to receive payment as environmental service providers. 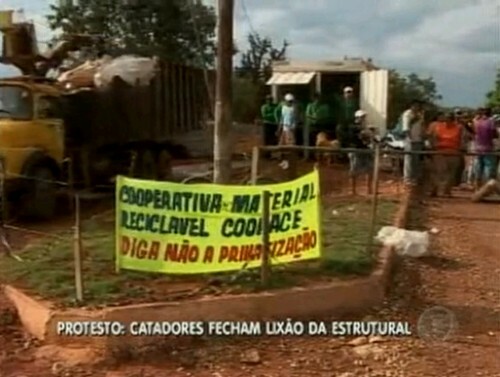 This has been an historical demand by the Brazilian National Movement of Waste Pickers (MNCR). Waste pickers will be paid according to the amount of recyclable material they collect at their cooperatives and associations. The number of associations registered has already reached 119 across all regions of the state, benefiting a total of 1,561 waste pickers. 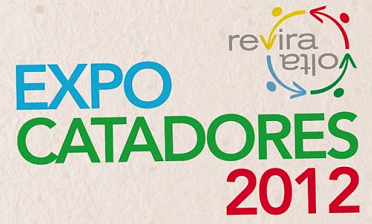 Read the MNCR press release (in Portuguese). Waste pickers’ organizations from Bogota demonstrated on November 8th along with more than 5,000 waste pickers at Plaza Bolivar, a major public square. As part of their historical negotiation process with the Bogota municipal government, they are fighting for a solid waste management plan that includes all waste pickers from the city as well as the entire recycling chain. See video as well as message and news articles shared by Silvio Ruiz Grisales, ARB. Keep informed with more updates coming soon with next news round-up! The Chilean waste pickers’ movement, is pleased to invite waste picker organizations, companies and institutions, NGOs, schools and others involved in waste recovery and those interested in the inclusion of waste pickers in sustainable solid waste management, to participate in the 4th National Waste Pickers’ Meeting. The Ministry of the Environment in Chile is preparing a solid waste management legislation based on producer responsibility. It’s a proposal that the waste pickers’ union has been following for years and it’s an opportunity to construct solid waste management that is both sustainable and socially inclusive. Follow the event on facebook. SWaCH officially terminated work on November 1 in the PCMC (the Pimpri Chinchwad Municipal Corporation). The workers have been ’employed’ by the new contractors that have applied for an interim 6 month contract floated by the PCMC. The waste pickers were told they will only be paid 100 Rupees per day, though the contract says 200 Rupees. The contractors are also all threatening that the waste pickers should not take away the recyclables, though they’ve continued to access it. At the second hearing on November 5, the judge chided PCMC for being retrogressive, suggested that waste pickers be included in the contract terms, and also urged the PCMC not to flout government directives. A temporary stay order has been issued on the 5 year contract that had been floated. They have asked PCMC to continue with the interim contract until they change the terms of the new contract. The next hearing is on November 26th. Link to this news. The All India Kabadi Mazdoor Mahasangh (AIKMM) is a membership-based organization of waste collectors. Carrying the struggle of waste collectors forward the AIKKM is organizing its First National Conference on December 10-11 in Bareilly, Uttar Pradesh. The conference will be attended by the waste collectors and their organizations from 12 states in India and will be preceded by a public rally on December 10 and followed by a National Seminar on December 11. The seminar topic will be, “Whose Waste, Who Profits: Impact of Waste Privatization on the Informal Sector.” Read the press release (in English). Alex Cardoso, MNCR (Brazil) and Cooperativa Reciclando Sueños (Argentina) sent messages of solidarity with Indian waste pickers’ struggle against incineration and privatization. Read messages of solidarity (in English).